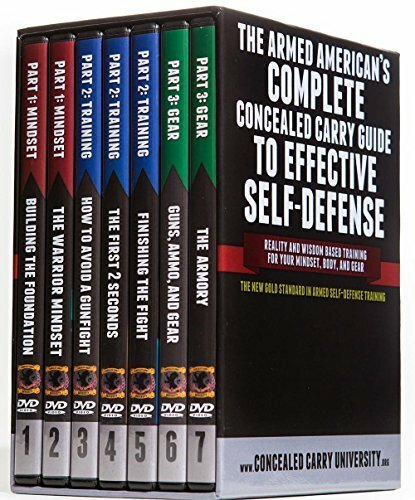 The Armed American's Complete Concealed Carry Guide to Effective Self-Defense, by Patrick Kilchermann, is a 7 disc DVD program that offers a complete education on what we have dubbed The 3 Pillars of Effective Self-Defense: | Mindset | Training | Gear | The 3 Pillars, when equal in strength, can support you in upwards of 90% of the potentially violent situations that you may encounter. If one pillar is weaker than the other, then your ability to defend yourself or your family begins to crumble. If you've got training and good gear but lack the Warrior Mindset, you're lacking. If you've got the Warrior Mindset and True Reality-Based Training.. but lack effective Gear, you're in trouble. And of course, a lack of Reality-Based training creates a vulnerability that no gear or mindset can help you shore up. The bottom line is that Effective Self-Defense requires Balance - and this is something that we have always observed is utterly lacking in the vast majority of options the Armed American has for training. Most training focuses solely on the physical side of training. Little attention is paid to Mindset or Gear, let alone the often overlooked aspects of physical training such as altercation Deterrence, Avoidance, De-Escalation and Escape. Until the The Armed American's Complete Concealed Carry Guide to Effective Self-Defense, the only option the Armed American had of obtaining a true, well-rounded education on Concealed Carry and Self-Defense was to wander the wasteland of books, websites, and tapes - attempting to put all the pieces together and sort out the truth from the myth... the wisdom from the anecdote... Concealed Carry doesn't have to be hard. It doesn't have to be stressful. But on the other side, Concealed Carry isn't a hobby. It's not a game. Concealed Carry is a very serious decision in your life (perhaps even the answer to a call of duty that you feel), and I want to be there with you every step of that journey. 20 hours of quality, reality-based, scientific Concealed Carry instruction and training, covering all three pillars of Effective Self-Defense: the Mindset, Training, and Equipment necessary for effective self-protection. This 'Complete' Guide is perfect for Beginner, Moderate, and Advanced skill levels. Whether you enter the program never having fired a handgun before, OR you have carried as a private citizen or police officer for years, you WILL learn a ton. Most people's experience is that their fundamental view of Self-Defense is completely altered. Warm, friendly instructrion by a kind instructor, Patrick Kilchermann. You will not be lectured or yelled at - there is no ego, opinions, or caliber-loyalties here. This program submits itself to the reality of a violent attack, and expects only that the viewer will as well. Filmed, Produced, Printed, Packaged, and Shipped from the USA (Indiana), using mostly American-made components. If you have any questions about this product by Concealed Carry University, contact us by completing and submitting the form below. If you are looking for a specif part number, please include it with your message.